In the summer of 2016, Favela Painting started the first project in their own country. 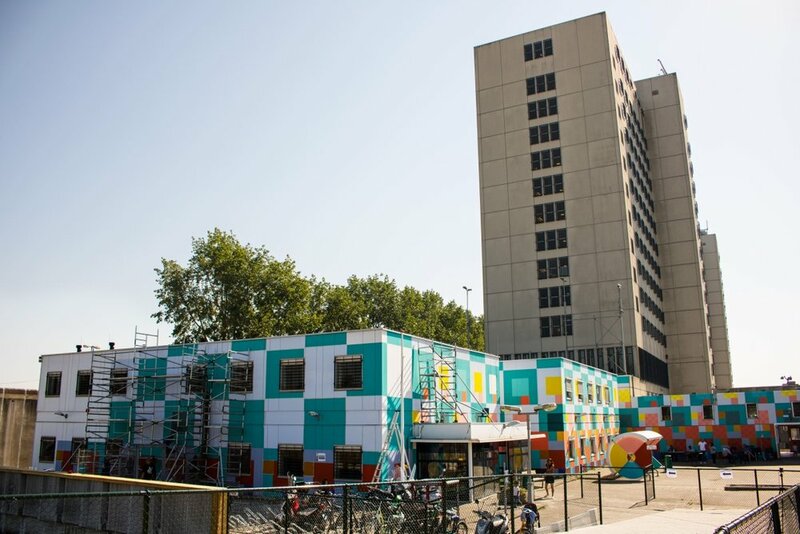 Together with a group of volunteers and refugees, they painted the entrance of the Center for Asylum Seekers ‘Wenckebachweg’ In the South East of Amsterdam. It is housed in the former ‘Bijlmerbajes’ prison, a huge building complex with six giant grey towers that have long been a eyesore in Amsterdam’s skyline. The project aims at transforming the buildings, both in-and outside, in order to recreate their new identity as a new home to the refugees that were soon to come. The project offers opportunities in form of skill training, network building and job opportunity, while empowering the participants to ‘make the place their own’. To achieve this, a participatory design workshop is planned, where the painters can help create the design ideas for the project. The project should soon become autonomous, yield a multinational team that collectively creates something amazing and transform a place with a very negative image to something extremely positive. The project is a collaboration between Favela Painting and other parties, including COA (Center for reception of refugees), the city government and private parties like the refugee company. Their collective goal is to include as many people and transform as many of the many grey spaces as possible - hopefully painting the entire building, inside and out, including the massive towers, creating a visual ‘postcard’, a new monument for the city and its new inhabitants.